If you know us you know that we are always making up some sort of pattern for our girls and that we have a definite signature style—vintage with a touch of modern. So to gear up for Fabric Fest I made one of our very favorite dresses. This style of dress is actually the first dress I ever drafted from scratch…using only Gracie’s measurements…and yes, yes, I have made a million of them. But never out of this fabric! This is a piece from Riley Blake’s Hipster Line and I’ve been obsessed with it since day one. (I’ve got the other pieces of it in various stages of becoming a quilt that I am over the moon about. )The thing that I liked so much about this fabric is that it has a vintage appeal but feels fresh and new. And from the moment I saw it I knew I needed to make a dress with it that had a white peter pan collar with cross stitching. It’s easy…and fun…and I love it. We have 2 yards of the same Hipster Cross Stitch fabric to giveaway along with another yard of white so you can try making your own cross stitched collar dress! All you have to do to enter to win the giveaway is leave us a comment telling us what your favorite flavor of ice cream is (since today is National Chocolate Ice Cream Day). 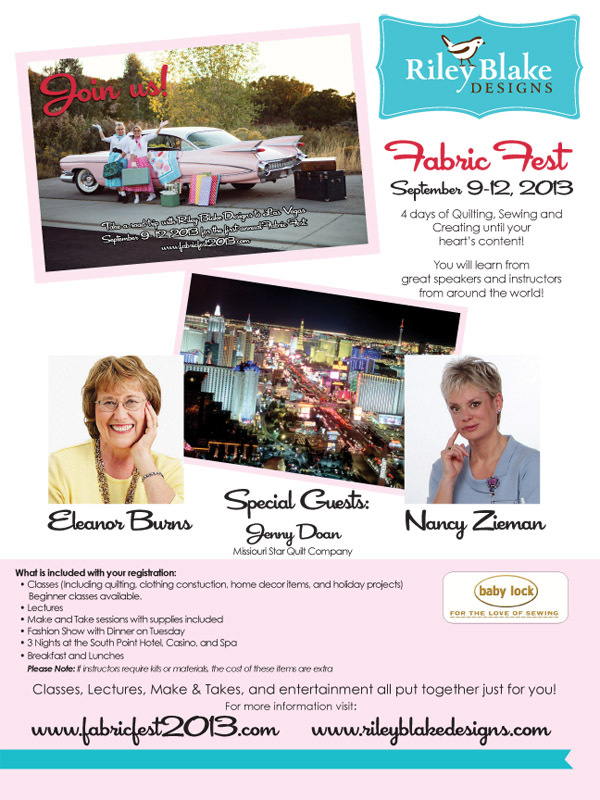 and when you are done with that check out Fabric Fest….we’d love to have you there with us! I am partial to coffee ice cream! Thanks for the chance to win. My great-niece would look adorable in this dress! Chocolate chip cookie dough!!!! Water in my mouth yummy! Or pistachio chocolate chip!! I’m a purist… just plain chocolate! Chocolate Chip Mint (but without the fake green food coloring)! The best ever ice cream is Moose Tracks…Hands Down! Mint Oreo cookie is the best ice cream EVER!!!! Blackberry revel is my favorite in the summertime. Chocolate marshmallow in the winter. My favorite is a good chocolate ice-cream. My favorite flavor has to be black cherry, so good! I am a bit limited in my ice cream choices since I’m allergic to dairy – but larry and lunas make a lovely chocolate fudge and hazelnut coconut milk ice cream that is just yum! We have a local ice cream store and my favorite flavor is coffee caramel crunch!! Cute dress – my husband’s niece would love it. My favorite ice cream is butter pecan. Thanks. I love good old fashioned vanilla! I love mint chocolate chip ice cream! Hope I win! I love chocolate ice cream in a sugar cone. Life doesn’t get any better than that!!! Pretty! I really like adding hand embroidery to dresses though I am not as good at the pre-planning it takes to do. Therefore not as many outfits end up with such lovely details. &mint chocolate chip all the way! Ben & Jerry Chocolate Brownie! My favorite ice cream (today) is Turtle Ice Cream. Mmmm, vanila with swirls of caramel and chocolate. What is not to like? My favorite ice cream flavor is… dependent upon where it is purchased :). I prefer to eat Blue Bell ice cream in just about any flavor, but since I no longer live in an area where it is sold I continue to dream about eating their Southern Hospitality flavor – YUM! My favourite ice cream is butterscotch ripple. That is such a darling little dress! My favorite ice cream is homemade vanilla ice cream with fresh strawberries…yum! Favorite ice cream – Blue Bell Pecan Pralines & Cream. My husband, son and I got a tour of their plant in Tulsa, OK and they just happened to be making the Pecan Pralines & Cream that day. The tour guide pulled a fresh half gallon off the floor for us. HEAVEN!!! It was so good – we just pigged out til we went into a sugar coma! I don’t play favorites with ice cream, but I recently had mint ice cream with Oreos and it was very good. Hi!!! Beautiful dress!!! Grace is a beauty too!!!! So pretty!!!! Love the fabric and the cross stitch collar!!! Well it is chocolate that is my favorite!!!! Thanks for the fun!!! Sweet fabric(and the model is adorable!). I have to vote for Cookie Dough! I love pecan prailines and homemade pumpkin pie ice cream. My favorite ice cream is Caramel Cashew from Culver’s Frozen Custard. Yum yum yummy! I have to say , I LOVE ALL flavors of ice cream, including black licorice. I seem to like ALL ice cream flavors…a favorite is Moose Tracks. Thanks for the chance. Salted caramel gelato by Talenti. It is AMAZING! Hmmm… lately… vanilla because I can top it with NUTELLA and make myself a Nutella shake. CRAVING IT! I am usually just a plain vanilla girl myself. Although when I want something a little different, I always check out Ben & Jerry’s. Love several of theirs: Chocolate Therapy, Imagine Whirled Peace, and Phish Food (my DH’s fave). My favourite is vanilla flavoured:) yum! One of my favorites is Choclate Almond Fudge ( can you have only one favorite?). close to that is homemade vanilla! Yum!! Ben and Jerry’s Coffee Heath Bar. Used to be Starbucks Java Chip but that started to taste like maple syrup instead of coffee. I love mint chocolate cookie from Ben and Jerry’s! I love vanilla! It was my grandpa’s favorite too! He passed when I was younger, but I have memories of sharing bowls of vanilla ice cream with him. Do I have to choose one!?!? How about a triple decker? Oh, ok, pecans and pralines…. My favorite flavor always varies by brand: cookie dough, rocky road, fudge brownie, but I always come back to basic fudge ripple in the end. My favorite ice cream flavor this week is mocha chip. I love any kind of ice cream with chocolate in it. I love the fabric and the dress with the little cross stitch collar. I love homemade strawberry ice cream. Or really good vanilla. Moose tracks all the way! though I’ve always thought that was a strange name, it’s so yummy! Chocolate peanut butter, isn’t it everyone’s?? Favorite ice cream? I love them ALL! Seriously, it’s a problem. That dress is just way too adorable! Coffee flavored ice cream,except at Christmas time,then peppermint stick 🙂 Can hardly wait for Fabric Fest!!! Do I have to decide on one flavor? Raspberry sorbet, Cookies&Cream, Lemon and Strawberry. Sweet Cream ice cream by far!!! Strawberry is the best, no debate! This is really cute! Love the collar. What is Jamocha Almond Fudge! I am salivating. Regular ole chocolate!! Love the dress and fabric!! Super cute dress and I love the colors in that fabric! Just lovely dress! I love both chocolate and butter pecan ice cream. I often combine the two. Cute dress and a very sweet model too! I love Coffee Flavoured Ice Cream!! Now I have a big craving for some!! My favorite would have to include peanut butter and chocolate mixed in vanilla ice cream. Love the fabric too! My favorite flavor is Ben/Jerry’s Heath Bar Crunch… Yummm. i haven’t had moose track in ages…. I love any kind of ice cream with lots of chunks of chocolate and nuts and such in it. The more chunks, the better! Only one flavor!!!! OK well i will have to go with vanilla, because i can put whatever toppin gon it I want! I love plain old vanilla. Usually I would say Mint Chocolate Chip, but recently, I have fallen in love with Ben & Jerry’s Crème Brulee’ = so yummy! I just made up a dress for my daughter and it didn’t turn out how I wanted it too, I need to take your class. I am a strawberry ice cream girl! Of course my favorite ice cream is chocolate!!! Looks like chocolate is many people’s favorites including mine! My favorite flavor of ice cream is chocolate with peanut butter chunks! Yum! Thank you for the chance! I LOVE Butter Pecan….always have. The dress is adorable, brings back memories of doiny that kind of handwork on my daughter’s dresses when she was little. Oh, how I miss that. Oooh, would love to make that for my adorable niece who sure knows how to brighten up anywhere she is. My favorite ice cream flavor is defiinitely cookies and cream. However, I’m going to start making my own fresh fruit ice cream. I’m so boring a person…I prefer vanilla 😛 I can eat maple as well. THat is truely a cute dress and the fabric so totally works with it! Homemade Milky Way Chocolate Ice Cream…………. To Die for! There used to be an ice cream called Coffee Toffee Crunch that I just loved! But sadly I have not been able to find it for a long time. So now I usually buy neopolitan to keep everyone in the family happy..I prefer the strawberry! Love pralines and cream ice cream. That dress is so super cute! I must admit I have never met an ice cream that I didn’t like. You can never go wrong with mint chocolate chip :). Ps that dress is too cute! I love vanilla with caramel sauce! I love Ben & Jerry’s Double Chocolate Fudge Brownie ice cream! My favorite ice cream is Rocky Road. But I wouldn’t turn down any ice cream flavor. That dress is adorable. Wish I had some little girls. Mine is all grown up. Thanks for the chance to win. My favorite flavor is either vanilla or chocolate marshmallow! I loooooove green tea ice cream. Lately, I’ve been making my own and it’s so good! My very favorite is Blue Bell Rocky Road….very yummy. Mocha Espresso Chunk. To die for! I am a plain vanilla girl….love your wee model and dress! Always strawberry! thanks for asking! I love Riley Blake! Cross-stitch is very fun. My favorite ice cream…chocolate! I love Breyers Mint Chocolate Chip. Brigham Young University Creamery has a yummy flavor called Ernestly Chocolate…chocolate ice cream, with caramel swirls and mini chocolate caramel cups. Oh heaven! Caramel fudge twirl or chunky monkey! Butterfinger ice cream! That dress is to die for! Nice work! Butter pecan! Ooh, now my mouthis watering! I like mint ice cream best, without the choc chips though. Ice cream – I love it all! I kinda feel that way about fabric too! But forced to commit to just one, I can’t get enough of vanilla with chunks of real strawberry. My favorite ice cream is whatever you are serving. I have yet to fine one I don’t love. I suppose if I have to choose, there’s nothing quite like a really good home made vanilla with real bits of vanilla bean in it.. Love the dress and the pretty model! I like chocolate with swirls of peanut butter in it. Mint chocolate chip…I love how it makes the cold colder. Wait I thought it was national donut day! Was that yesterday? Luckily I went with my boyfriend to get ice cream last night and got my favorite, peppermint. Thank you for the giveaway! Vanilla is my fave! I love the cross stitch collar. Plain old chocolate has always been my favorite! I love Maple Pecan and Butterfinger Swirl. Moose Tracks is my favorite!! Love the dress!! Would like to make one for my granddaughter. Dutch Chocolate is my favorite. Your dress is just beautiful and I’d definitely make one like it if I win – wow! I love natural vanilla the best! Love the dress pattern and fabric! My favorite is anything with chocolate. I love ice cream and I love this dress and the Riley Blake fabric. It would be adorable on my little granddaughter. One of my favorites is Rocky Road ice cream! You get the hit of the chocolate, with crunchy nuts and gooey marshmallows!! Yummy! My favorite ice cream is Chocolate ripple. I have WAY too many favorite flavors – but can’t go wrong with Choc. chip cookie dough! My favorite ice cream is Peanut Butter ‘n Chocolate! It’s heaven in a cup! Thanks for the giveaway! My favorite ice cream is Chocolate! Thanks for the chance to win! My favourite is hokey pokey – vanilla with honeycomb. I LOVE anything that has peanut butter and chocolate. The best is chocolate with peanut butter swirled into it. Edy’s Slow Churned Half the Fat Coconut Cookie Crumble! It is so good! My fave ice cream flavor is mint chocolate chip YUM!!!! I love rocky road ice cream and strawberry and chocolate chip and…….love them all! i will have to check out the rest of the range. The best ice cream is anything with chocolate and peanut butter and/or caramel. My favorite ice cream is vanilla or chocolate marshmallow! I know….plain, but I LOVE them! I don’t discriminate! When I was younger, I used to love going to Baskin Robbins and getting the pink bubblegum ice cream because it came with pieces of gum in it. But now, I’m much more boring 😉 I usually go for a good vanilla with caramel. My favorite is Rocky Road and lots and lots of others too. what a cute collar. my favorite ice cream is Edy’s Espresso chip. Butter pecan — love it!! Although I’m also a sucker for strawberry, mint chocolate chip, and Dutch chocolate. My favorite ice cream flavor has to be Strawberry. Chocolate Chip cookie dough is my favorite. But i love soft serve and adore soft serve custard swirl (chocolate/vanilla swirl) the best. My favorite is chunky mint chocolate chip. Strawberry buttermilk. Tangy buttermilk with sweet berries. Butter Brickle is the best! CHOCOLATE!! Chocolate, chocolate, chocolate,…did I say chocolate? YES, chocolate and more chocolate! Ice Cream–gotta love chocolate with fudge swirls!! Butter Pecan is my favorite. Love the dress and collar. Thanks for the chance to win. A scoop of black cherry and a scoop of chocolate ice cream is my favourite! Cherry chocolate ice cream is my favorite…for today anyways. Oh wow…love most all Ice Cream!! lol Love Moose Tracks best tho!!! Gotta keep freezer stocked too!! 🙂 YUM!!! Love your model! She looks adorable in her new dress!!! You did Awesome job too…love the cross-stitch added to collar! Very cooool!!! My favorite flavor of ice cream is Chocolate Marshmallow. Mint Chocolate Chip! What a sweet dress, reminds me of a dress I had when I was a youngster. Tough decision since I love them all but I will say Black Cherry! Love that cute little dress!!! Double Chocolate Malted Krunch is my very favorite and has been since I was like 10….38 years!! My favorite is Butter Pecan! Easy and tasty. Thanks for sharing! My current fav is chocolate chip cookie dough. Yum! Schwan’s makes a pumpkin caramel praline ice cream that is delicious. Your dress is beautiful and your model so cute… Thanks for the giveaway. My favorite ice creams are chocolate chip mint and cherries jubilee! I love something called Chocolate Cookie Quarry, yummy chocolate ice cream with chocolate oreos crushed in it. Yum! I guess since it is National Chocolate ice cream day that I’ll will have some tonight in celebration of the holiday! Love the dress. It’s so pretty with the collar embellished like that. My favorite ice cream is Toffee Almond Chill. A new favor that came out a couple of years ago. Thanks for having such a wonderful give away. Nice prize. Hi. The little dress is so sweet. I can see my grand baby in it! (-: My most favorite ice cream is Vanilla Bean. Yum yum. Thanks for chance to win. That dress is just adorable. And your little addition of the cross stitch is just perfect with that fabric. Hmmmmmm my favorite ice cream? The kind that’s frozen. HA. Ok, serioiusly, I absolutely love French Vanilla but it must be a really good one. This is a wonderful dress and the stitching accents are lovely. I love chocolate fudge ice cream. Right now, my favourite pick is sour cherry ice cream. It is great. Thanks for sharing. 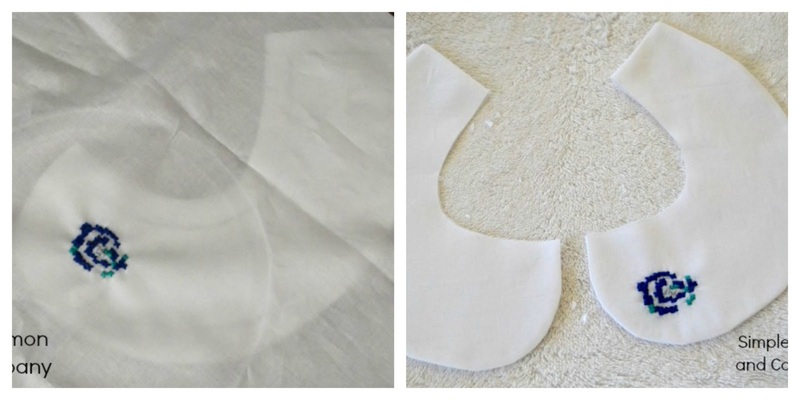 Love the fabric you used for the dress and the collar stitching is perfect! Favorite ice cream flavor is white chocolate raspberry by Dove. Thank you for the great giveaway. I am a vanilla gal. And can I saw OMG I need this fabric ASAP, so lovely!! I am a vanilla gal. And can I say OMG I need this fabric ASAP, so lovely!! Love this dress. It is sew cute. Of course my favorite ice cream is chocolate! Starbucks java chip! Yummmm! BTW, extra cute dress! The fabric and collar design are fabooo! My favorite ice cream is Death By Chocolate! I haven’t had any since I moved west almost 10 years ago. I’ll have to ask my daughter if they still make it. Peanut butter and chocolate from Baskin Robbins!!!! I love this dress, from the design to the fabric to the little cross stitch on the collar. I’ve cross stitched for years but I’ve never thought to do it like that! Vanilla is my favorite ice cream. The colors in the fabric are just gorgeous. Oh my goodness what a perfect dress!!! And that fabric is amazing! 🙂 I love coconut pineapple ice cream and bunny tracks. Rocky Road, hands down! Thanks for the giveaway!! Your dress is awesome. My favorite flavor is cherry cheesecake. Just love homemade vanilla with pineapple. Why? Because the kids and hubby don’t like it = more for me!! Can’t wait for Fabric Fest, I am looking forward to the classes and meeting new people with a similar love of fabric! I love ice cream it is hard for me to choose one. But I think maybe any with chocolate and peanut butter swirled together would be a winner. Strawberry! What an adorable dress. My favorite ice cream flavor is Mint Chocolate Chip, followed by Rocky Road, followed by, Moose Tracks, follwed by…. notice a pattern here? They all conain chocoate! BTW, I am really lovin’ this Blog Hop! Homemade Girl Scout Mint Cookie ice cream…not sure if I like it because you can only buy the cookies once a year or because it is homemade or both. The dress is adorable! I am vanilla all the way! The fashion show will be so much fun…hope I can go…. My favorite ice cream flavor is, VANILLA BEAN, yes I know I am a little boring with the flavor, but I love to dust it with cinnamon, yum, yum, yum…. Thanks for entering me in your drawing! Such a daring little girl and the dress she is wearing! I would be pleased to be the winner of your lovely fabric. Favorite ice cream? Peppermint with hot fudge topping. Mint Cookies and Cream by Blue Bell is my fave! Thanks for the chance to win. Ben & Jerry’s American Cone Dream. Anything chocolate, so more on the brownish side, but I had red velvet ice cream tonight…beautiful cocoa red! Favorite ice cream? Black Cherry–or licorice, which I can never find but loved as a kid. P.S. Your cross-stitched collar is precious, as is your model. I don’t drink coffee, but I love coffee ice cream! What a sweet dress! My favorite is a chocolate ice-cream! Just one, when I could eat ice cream I would try a different kind every time I went to the store. I would buy a pint and the kids and I would share it. We each got a couple of spoon fulls. I suppose I would choose strawberry but really I loved them all. I like Jamoica Almond Fudge at Baskin Robbins! Love the cross stitch fabric and thanks for the giveaway. Favorite ice cream is Starbucks Java Chip! Yum! Love that fabric, and the collar is so flippin’ cute! My favorite ice cream is maple walnut- it is always yummy. I love the addition of the cross stitch to the little girl collar. I love your sweet little dress! I would love to be able to make them for my 2 little granddaughters someday. My favorite ice cream is coconut! Icecream? Real Italian limone gelato! my favorite ice cream is butter pecan or pecan praline… YUM! and NOW i want ice cream. thanks. LOL! Sweet little dress! Vanilla, and it must be Blue Bell. I’ve developed an addiction for salted caramel ice cream. And that is one darling little dress! My favorite flavor is Pistachio. Can never pass that up. My favorite ice cream is Mayfield Bithday Cake! coconut chip, all the way (coconut ice cream with semi-sweet chunks) YUM!!!! If I have to choose I would say moose tracks – yum, yum! Thanks for the chance. Cute! Now i am visualizing what I can add cross stitch to. FUN! My favorite ice cream is Mocha Almond Fudge. yum! Butter pecan – sweet and salty – yum! Beautiful, ladylike dress, and the fabric is perfect for it. Many thanks for the chance! Good old Butter Pecan! Btw, I have a granddaughter who would LOVE a dress made of this fabric! Am I too late? My favorite ice cream is Moose Tracks. Usually I’d say Mint Chocolate Chip is my favorite but today Coffee ice cream sounds really good to me. I am a chocolate ice cream lover:) Yums!!! This is such a precious dress. One of my granddaughters would look adorable in it. Pralines and Cream is to die for ice cream. Praline CRUNCH! And I am not above digging around and making sure everyone else gets just the vanilla part with a little praline flavor. If I have my absolute choice, I go for coffee ice cream and then I add lots of nuts. This is my favorite treat at Coldstone’s!! Peppermint. Can’t get enough of it. Good thing it’s only available seasonally. My favorite ice cream is butter pecan. Ummmm do I love it! My favorite ice cream is all ice cream. Since I can’t have “ice cream” anymore I have found some great alternatives. I am loving the mint chip made with coconut milk and pomegranate with dark chocolate (dairy free). Yum, yum, yum!! The dress is so cute, thanks for the giveaway! What an adorable dress & I love the idea of the cross stitch on the collar! My favorite flavor is Chocolate Chip cookie dough! 🙂 Thanks for the giveaway! Mint chocolate chip has always been mine favorite ice cream. Can you believe I don’t even like ice cream? I prefer to eat plain greek yogurt with some granola and fruit added. Love your beautiful dress! Favorite flavor is chocolate marshmallow. I LOVE that print!!! Bryers Banana Fudge Ripple. I only see it in the summer months. I better be seeing it soon. that little dress is so very cute! Oooh, hard to choose one, but I guess it’s Rocky Road. Hmmm, I still don’t see my comment on your blog – I commented around 10:30 this morning. Guess I just need to do it again. My first choice is coffee ice cream and I love LOTS of nuts in it, too. That’s always what I ask for at Coldstone’s!! I like chocolate chip ice cream, with vanilla running a close second. When I went to college they had brownies and cherries…it was my favorite…I haven’t found it again. I’m so excited to have found your blog! I have a 4yr old granddaughter who has twin 1yr old sisters and I’ve been wanting to sew something (other than quilts) for them. You’ve totally inspired me! Favorite flavor ice cream is totally B&J Phish Food…lots of goodness in one little pint! Love the cute dress and your creative cross stitch on the collar that goes so well with the cross stitch fabric. My new favorite ice cream flavor is Tillamook mudslide. Yum, very good chocolate. Superman ice cream is the best!!!! I made a few cross stitch collars for my daughters outfits. They are fun, now I’m hoping for a granddaughter. =) I like cherry cheesecake ice cream. Chocolate is my favorite. Know just who would love a cross stitch jpattern. Thanks. I love French Vanilla ice cream best of all! My favorite flavor of ice cream is Strawberry… Love the color of the dress. Thanks for the chance to win! Let me think….it’s a toss up between strawberry ice cream and mango ice cream. Those are my two favorite flavors. Thank you for the chance to win. My favorite ice cream is any kind of chocolate ice cream. Thank you for a chance to win such cute fabric. 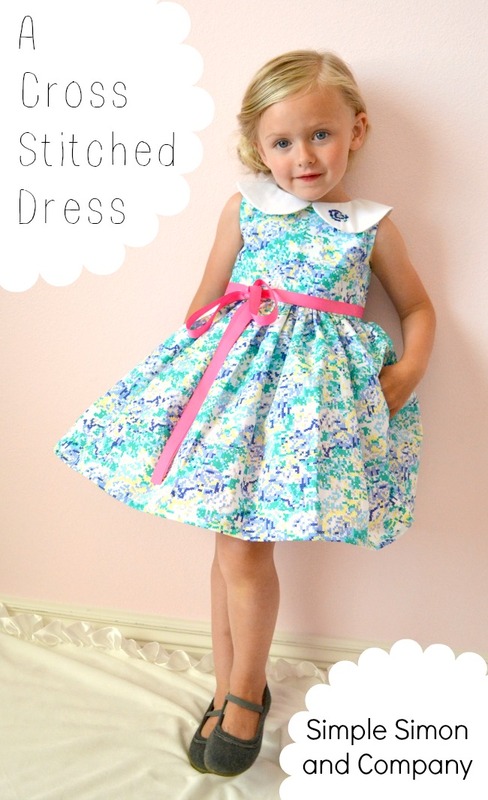 Love the simplicity of the precious collar on the adorable dress. Favorite ice cream would have to be anything chocolate! How about Mint Chocolate! What an adorable dress! You did a beautiful job! My favorite flavor of ice cream is Gold Medal Ribbon. I discovered this when I was pregnant and having a craving, hehe. That dress is completely sweet!! I’m looking forward to being able to sew for my new grand-daughter who will join us this October. My favorite ice cream is Spumoni!! I love all icecream, but my favorite brand is called umqua. Yummy!! My favorite ice cream is Chocolate Marshmallow. White Turtle from Brewsters. Vanilla ice cream with pecans and caramel. Strawberry is my favorite. Thank you for the chance to win. Such a pretty dress! Love the cross stiched detail on the colar, my niece would look adorable on this 😉 ….I love every single ice cream flavor I have tried 😉 but especially so: german chocolate and nutty coconut, thanks for the chance to win! The dress is great, and my favorite ice cream is Chocolate and Raspberry Shakes from Bear Lake. Thanks for the chance to win. I am totally a Moose Tracks kind of girl! YUM!! Those dresses remind me of the clothes I wore as a child growing up in the 50’s. Our school uniform white blouse had a Peter Pan collar, just like the round white one on that cute little dress. Mint chip is my favorite flavor ice cream. From California, thanks for the opportunity for a fantastic give-away. I really like Cherry Nut but it’s very hard to find anymore. Very cute dress! My favorite ice cream is peanut butter and chocolate! Yummmy! I love chocolate with hot fudge topping! Thanks!! Mint Chocolate Chip is by far the best flavor of ice cream. 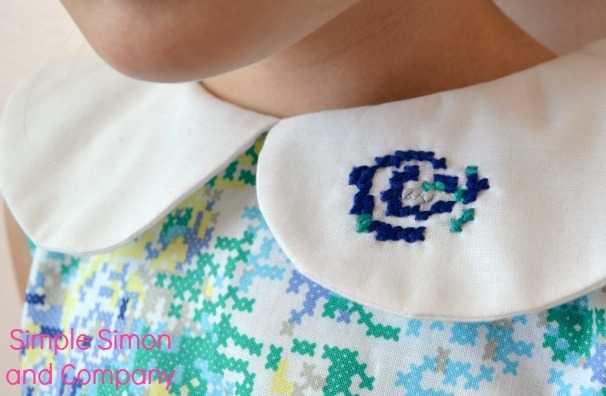 I love your idea for cross stitching on the collar – what a nice touch. My favorite ice creams are pistachio and butter pecan – I can never decide which I want, so I get one scoop of each! I love Peppermint! mmmmmm….Peppermint ice cream! Love the ideas on your blog! Mint chocolate chip, that’s my favorite ice cream. I love Blue Bell Praline pecan. Hands down, jamocha almond fudge. Mmmmmm. Dang it, now I want some! Chocolate chip cookie dough hands down! THIN MINT Girl Scout Ice cream!!! I love love love it when I can get it – otherwise I am a sucker for rainbow sherbert! LOVE this dress!! So sweet!!! Really strong homemade type vanilla ice cream is my favorite. Mmmmm, my mouth is watering thinking about it. My favorite flavor is Vanilla Bean or Ben & Jerry’s Half Baked. I love the dress too! Thrifty’s Chocolate almond fudge which I can’t find anymore! I adore hazelnut ice cream. I am addicted! Butter Brickle … hard to find so is a very special treat when I do find it!